1. 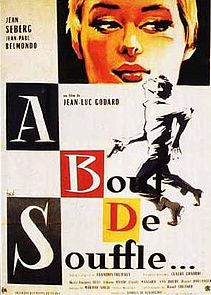 1959, romance/ drama, directed by Jean Luc Godard, written by Francois Truffaut and Jean Luc Godard, Stars Jean Paul Belmondo and Jean Seberg. 2. Breathless tells the story of a petty criminal named Michel who stole a car and killed a patrolman who chased after him. Michel stays in the city and spends his time trying to convince his American girlfriend Patricia to run away to Rome with him. He eventually convinces her to run away but she ends up betraying him and Michel ends up getting gunned down by the police collapsing in the street out of breath after a chase. 3. Breathless relates to my text because the movie uses many of the principles of film that are mentioned in chapter two. The most important are the use of lighting in the film, it being shot in black and white and using elements of realism. The lighting in the movie is sparse and natural usually being found coming through windows and open city streets. The lack of lighting actually makes it seem more realistic which is along besides the dialogue and setting ways in which the film was shaped in a realistic tone. The characters were not generic cut outs in the way many Hollywood had typical type characters and the settings were very basic and shot naturally. 4. The film theory that I think applies to this movie is the editing to the movie. Godard used jump cuts within movement or dialogue to help show the illusion of continuous time and space within the movie. 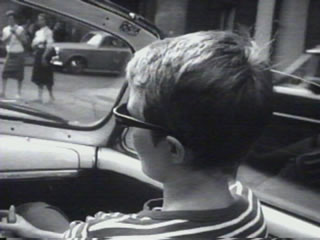 The scene where Patricia is driving in the car with Michel is an example where a jump cut causes her head to turn abruptly and it in turn creates a jarring effect through the emphasis of the two distinct shots. 5. The popular article that I found for Breathless is an essay by Roger Ebert in which he talks about the influence of the film and how some of the technical marvels were achieved. Ebert speaks about how the film was as influential as Citizen Kane and a precursor to all of the film detailing youth revolt that came about during the 60s. 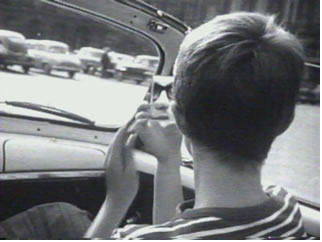 Ebert says breathless had gathered “a body of legend” about its shooting, between the spontaneous feel of the film, the quickly written dialogue and makeshift techniques. The actors were given lines for the shoots briefly before hand so they could keep a spontaneous and fresh feeling to the film. They also shot scenes handheld shunning lighting and lacking in equipment such as dollies which they substituted for a wheelchair. Ebert ends by saying that Godard achieved a turning point in cinema that rivaled Welles and D.W. Griffith. The second scholarly article is titled The Cinema of the Interstice:Jean Luc Godard’s Prenom Carmen and the Power of Montage. The article deals with the director’s use of montage and how he uses it to cut through reality from different types of images. Montage is considered important to use in creating a style of cinematography that is more advanced that previous styles in film making. 6. I felt that breathless was an exceptional film that paid homage to American cinema and built upon it to create something new and unique. It told a story that seemed to be gritty and realistic, being shot hand held gives it a feeling that a steady camera would not evoke. Watching the movie I see all the movies that came after it involving the young man trying to play a tough guy, I see influence in less romanticized more gritty tales that came about in the 60s and 70s. Godard may have framed his movie after American films before it but his movie went on to influence American directors to create movies using his same aesthetics. Ebert, Roger. "Breathless :: Rogerebert.com :: Great Movies." Rogerebert.com. 20 July 2003. Web. 02 Mar. 2012. 1) ( x ) I have not handed in this assignment for any other class. 2) ( x ) If I reused any information from other papers I have written for other classes, I clearly explain that in the paper. 3) (x ) If I used any passages word for word, I put quotations around those words, or used indentation and citation within the text. 4) ( x ) I have not padded the bibliography. I have used all sources cited in the bibliography in the text of the paper. 5) ( x ) I have cited in the bibliography only the pages I personally read. 6) ( x ) I have used direct quotations only in cases where it could not be stated in another way. I cited the source within the paper and in the bibliography. 7) ( x ) I did not so over-use direct quotations that the paper lacks interpretation or originality. 8) ( x ) I checked yes on steps 1-7 and therefore have been fully transparent about the research and ideas used in my paper.